When Matthew Timion needed to get his son treatment for mental illness, he did not anticipate it would be so hard to get the insurance company to pay for it. Timion adopted his son out of foster care when he was 3. He says the trauma and neglect his son experienced in his early childhood led to mental health issues later in life. At age 10, Timion’s son began to act out aggressively and threaten violence. At one point, Timion was bringing his son to an inpatient psychiatric hospital in the Chicago area every few weeks. At times, the insurance company and the hospital staff disagreed over whether treatment was necessary. Timion filed multiple appeals and won. But months later, when his son needed even more costly residential treatment, Timion almost relinquished parental custody to force the state to step in and pay for treatment he couldn’t afford. But data from Illinois shows not all parents can navigate insurance for their children like Timion. Dozens of children a year enter state custody when parents run out of options for getting them the mental health care they need. Fundamentally, this issue of who pays for mental health treatment comes down to a law that requires insurance companies to cover mental health care at the same level as other medical conditions. To get an insurance company to pay for a claim they’ve denied, patients can file an appeal. But if the internal reviewer—a medical doctor employed by the insurance company—agrees the treatment isn’t needed, the patient has to pay the bill. When this happened to Timion, he appealed to the state agency that regulates insurers. The case was reviewed by a psychiatrist, who determined Timion’s son needed to be at the hospital, and the insurance company, Blue Cross Blue Shield of Illinois, must pay for it. “So in our case it worked out,” Timion says. “Most people don’t have the tenacity to go through this process,” especially if they’re in the middle of a crisis with their child." A 2015 survey from the National Alliance on Mental Illness suggests Timion’s experience is not unique. NAMI asked consumers across the country about their experience with private insurers, and found that people seeking coverage for mental health services report being denied at a rate double those wanting coverage for other medical services. Blue Cross Blue Shield of Illinois declined an interview but sent a statement saying the level of care they cover for group, individual and family health insurance policies is based on medical necessity, which includes looking at national guidelines and the needs of individual members. For members who receive health coverage through a government-sponsored program, BCBSIL says coverage is determined by the state or the Centers for Medicare and Medicaid Services. Ten years ago, Congress enacted the Mental Health Parity and Addiction Equity Act. It requires most insurance companies to cover mental illness on par with other medical issues. But the law doesn’t require insurers to cover all mental health treatments. Rather, they must demonstrate they cover mental and physical health equally. David Lloyd, national senior policy adviser for the mental health advocacy group the Kennedy Forum, says insurance companies have made some progress toward compliance with parity laws. They no longer charge higher deductibles or have stricter limits on mental health services. But potential violations include denying coverage they deem unnecessary. John Foley, CEO of Benefit Consulting Group in Northbrook, Ill., says during a time of rising health care costs, insurers don’t want to spend money on expensive treatments that aren’t absolutely needed. Part of the challenge is that what’s medically necessary is sometimes up for debate, says Foley. If someone breaks a bone, they need a cast. But with issues pertaining to mental health, it’s not always as clear-cut. Foley says there are also financial incentives on both sides: Providers make more money on expensive treatments, while insurers save money by denying that same care. Advocates say regulators need to step up and do a better job enforcing existing laws so that the burden doesn’t fall to patients in crisis—or their families—to battle insurers when mental health coverage gets denied. In recent years, state and federal regulators have taken steps to improve compliance with parity laws. A 2014 investigation led by New York Attorney General Eric Schneiderman uncovered numerous parity violations by private insurers, resulting in settlementsthat forced the companies to return millions of dollars to consumers. In 2014 and again in 2017, the state of California fined Kaiser Permanente for failing to provide members with timely access to mental health care. In Illinois, where Timion is, Governor Bruce Rauner recently signed into law a measure advocates say will enable greater enforcement of parity laws by increasing transparency and accountability for health plans. Lloyd says Illinois now has the strictest mental health parity laws in the country, and he hopes other states will follow suit. Mental health coverage denials can have dire consequences on families. When Matthew Timion's son was 10, he began to hear voices, act out violently and cut himself. 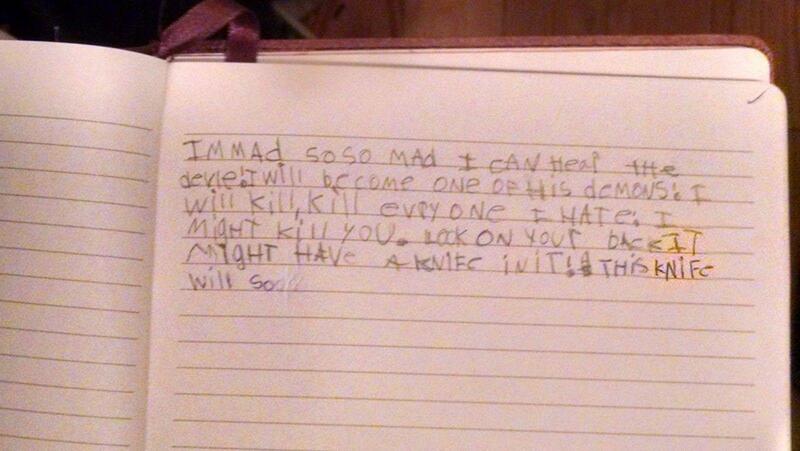 Timion found this entry from in his son's journal around that time. When Timion’s son was hospitalized again at age 13, doctors said it wasn’t safe for him to return home. He needed to go to a residential treatment center to receive 24/7 care, which can cost up to $200,000 a year. Timion’s insurance company said they would cover one month. But many facilities won’t accept a patient without proof of payment for at least six months, which Timion did not have. While his son remained at the psychiatric hospital, Timion says he spent eight hours a day for more than a month on the phone with his insurance company, state agencies, even lawmakers, trying to figure out how to pay for residential treatment. Thanks to a family connection with a mental health facility nearby, Timion moved his son from the hospital into residential treatment. The month covered by his insurance company ran out, but he convinced the child welfare agency to cover treatment until a state grant would kick in to pay for the remainder of his son’s treatment. “Mental health care is not treated the same way as cancer or anything else,” Timion says. “So people have to go through these ridiculous hoops” to get treatments covered. The Kennedy Forum’s David Lloyd says Timion’s story is an example of why it’s in states’ best interests to ensure parity laws are enforced. “Costs are going to be picked up by taxpayers in one way or another,” he says. Timion’s son is now 15 and just moved home to Illinois after a year-and-a-half at another residential facility in Missouri. His son is doing much better, Timion says, but there’s still a long road ahead. He worries about parents who aren’t able to access mental health treatment for their child. Doctors, nurses and staffers lined up for t-shirts, temporary tattoos and even some early morning ice cream at Nationwide Children’s Hospital near German Village. In honor of World Mental Health Day, the hospital has launched an initiative spotlighting the issue among children. Opioid addiction continues to deplete Ohio’s communities and is driving up the number of children entering foster care. It’s been a year since the Ohio Attorney General’s office granted money for 30 Days to Family Ohio to address the issue. 30 Days to Family Ohio was created to move children from foster care to family care in the shortest time possible. In its second year, the program is looking for more funding and county involvement. Today on All Sides, we check in on the initiative and scope of foster care in Ohio. Ohio has launched a program to help young adults who have aged out of the foster care system make the transition to living independently.